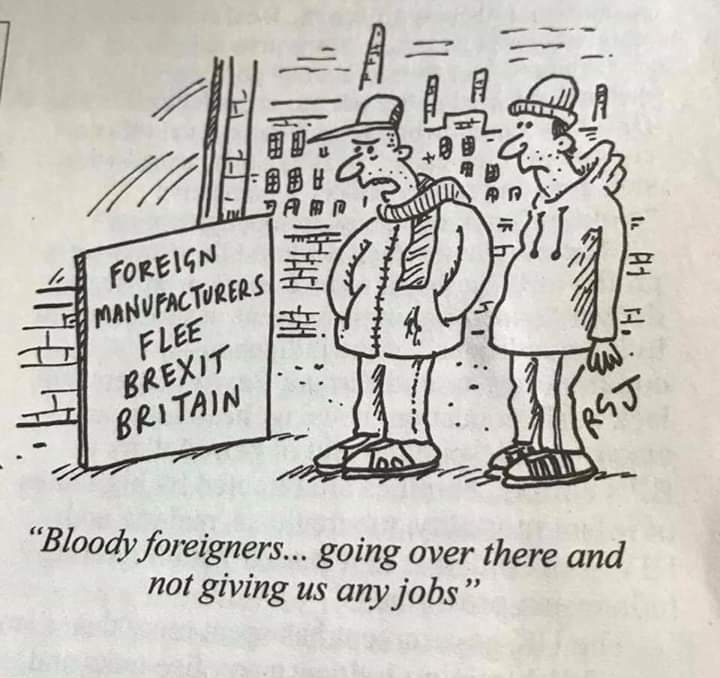 According to this story, around a third of British businesses are making plans to or have already relocated some staff to Europe in preparation for Brexit. That’ll be another thing they didn’t manage to get onto the side of a bus. Oh, and because that idiot schoolboy, Gavin Williamson (aged 13 1/4, dunce of the lower third), threatened China with an aircraft carrier which isn’t ready and which has no planes, Deputy Prime Minister Hu has cancelled trade talks with the UK. But it’s OK. We don’t really need a trade deal with China. Mr F… oh damn, sorry, DOCTOR Fox has just signed a deal with the Faroe Islands. So Nah nah nah nah nah, to you China. That’s what we get when Our Government’s shite. Author trispwPosted on February 14, 2019 February 14, 2019 Tags Brexit, China, Gavin Williamson, jobs, trade talks9 Comments on WHAT A DAMNED CHEEK! Still, this bloke called her out for her lies. If you have to make up stuff to criticise the government in Scotland, that sort of suggests to me that you can’t actually find anything that you can truthfully call them out on. The Chinese are nearly finished the bridge and tunnel from Hong Kong to Macau, a distance of 25 miles. Worked started in 2009 and it is expected to open this year. So, Boris, the man who was determined to split Britain from Euopre thinks that there should be a bridge between England and France, apparently the two great military powers of Europe. Friends of Boris said that the president was enthusiastic about the project, although I suspect that “la politesse française” may have prevented him from saying what he really thought. Author trispwPosted on January 19, 2018 January 19, 2018 Tags Boris Johnson, Bridge, China, England, France, Hong Kong, Macau, President Macron42 Comments on A BRIDGE TOO FAR? Possibility 1: He’s not very bright and he isn’t on top of his brief. He wasn’t engaged when Dr Brown was making these statements. No one told him what was going on. He was, after all, only Minister of State at the Scottish Office at the time. Possibility 2: He’s a liar. And, moreover, he is, as Scottish Secretary (having been promoted due to Alistair L Carmichael’s departure from government [L is for Liar by the way]) lying to parliament and to the Speaker, as well as to us plebs. On an entirely separate point, I’m wondering what his colleague (the lady sitting next to him) came as. I’m a great believer in equality. Unlike the Scottish Labour Equalities spokesperson, Elaine Smith, I back it all the way. I’m an anti-discrimination kind of person. I’ve been backing Carrie Gracie in her row with the BBC. Remuneration, I reckon, should be based on the difficulty of the job, not on the gender, colour, religion or sexuality of the incumbent. And given what a hard job she had, she probably should have been earing a good deal more than her colleagues in “easier” places in the world. Just for a start, she is fluent in Cantonese, which I suspect her counter[part in the USA is not. And I don’t think it is ‘political correctness’ to have the views of Black, Asian, White, LGBTQ, male, female, Christian, Muslim, Jewish, etc. people heard in parliament, or in the cabinet. I don’t think there should be quotas but I think we need a parliament that reflects life in Scotland (or the UK). I also don’t think that clothes are that important. As long as they are clean, keep you warm and cover your private bits, I can’t see that it makes a lot of difference if MPs wear jeans and t-shirts. However, we are where we are, and what’s good for one is good for another, and I was just wondering what the Speaker would say if a man turned up to sit on the front bench wearing a stripy t-shirt. Seriously, if there is a dress code for men (and there is), there should be a dress code for women.